Ambling along the banks of the Arno was one of our favourite things to do in Florence and the best way to see the city. Our apartment was steps away and perfectly positioned to take maximum advantage of the river and its views. 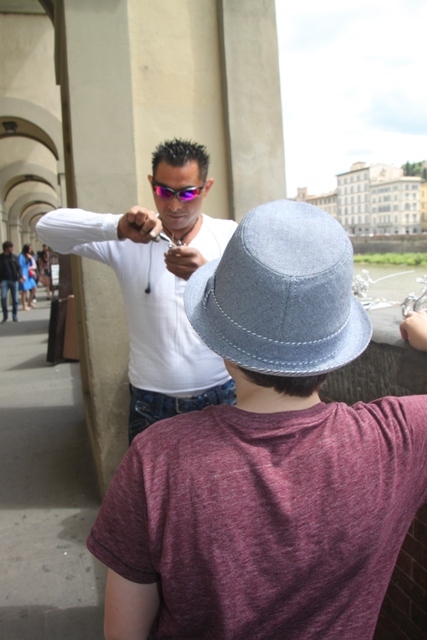 Despite its well-deserved reputation as a tourist magnet, we found ourselves irresistibly drawn to the Ponte Vecchio. A higgledy piggledy three storey bridge full of jewellery shops jutting periously over the edges it is a Florence highlight. Even the Nazis and Hitler appreciated this bridge. When they retreated at the end of World War 2 they destroyed all of Florence’s other routes across the Arno but left the Ponte Vecchio untouched. The bridge was built in 1345 and from a distance looks as though it should still have the original blacksmith and butchers shops of the medieval period. The Medici dukes objected to the stench of dead meat and had the butchers replaced by the goldsmiths and silversmiths who still occupy them today. It must be said though, that unless you have a penchant for overpriced and fairly tacky gold jewellery the bridge is best appreciated by strolling briskly across (or from afar!). One member of our family, magpie like, is always attracted by any sort of tourist tat so a quick march over the bridge was out of the question for us. We found lots of artists and other artisans selling paintings and other bits and pieces on the river banks just beyond the bridge. 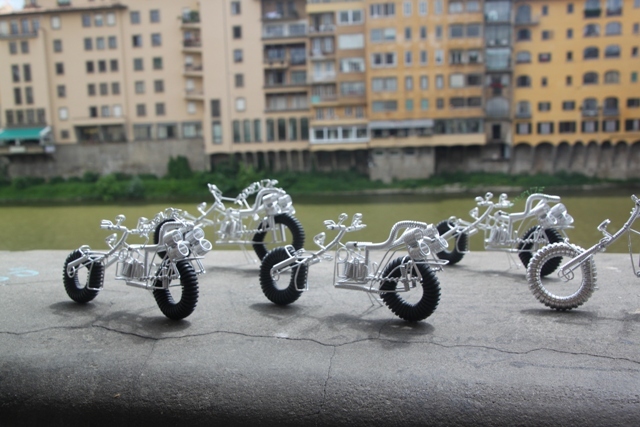 Son was captivated by a man making motorbikes out of old wire. Needless to say we came away with our very own motorbike and all watched enthralled as the man moulded Son’s name across the handlebars. After firing a barrage of questions at the man, Son discovered he also worked in a bar/gelateria across the street and when we returned later that day, having recognised his new friend, the very kind man arrived with a tray of gelato in a multitude of flavours for Son to sample. A friend for life! 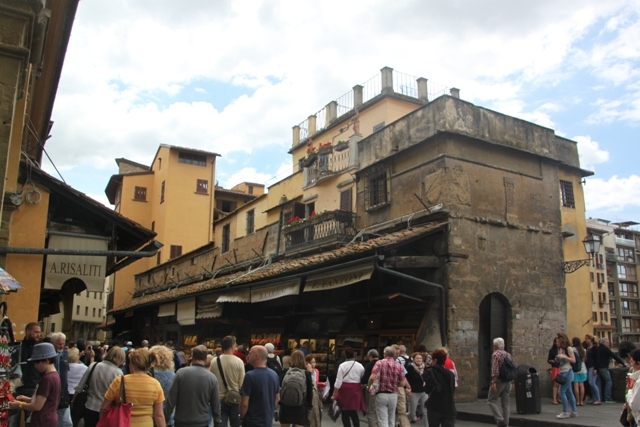 Another of our Florence favourites was also steps from the Ponte Vecchio – the Mercato Nuovo. 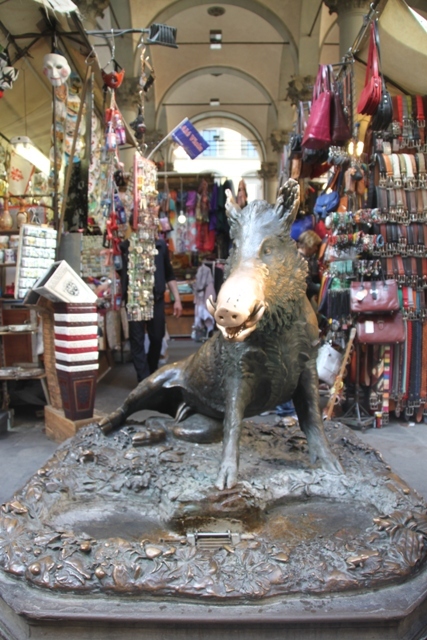 A bustling market selling leather goods, handbags and other tourist trinkets for us it was all about Il Porcellino. A bronze sculpture and fountain they say that a rub of the boar’s snout and a coin inserted into his mouth guarantees a return trip. 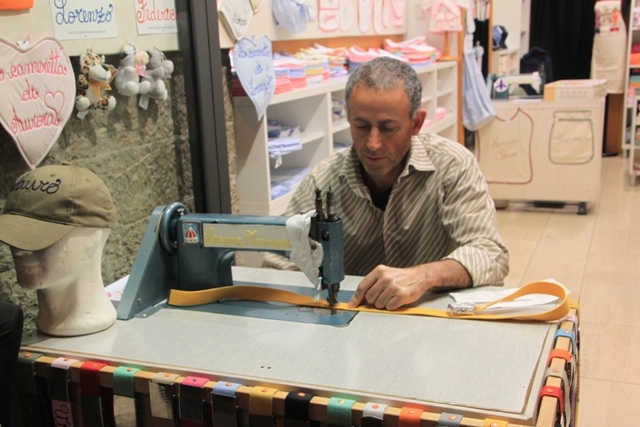 We were also seriously impressed with a man near the market who was a sewing machine whizz – he stitched Son’s name on a belt while we waited – super impressive. On our last evening in the city (and most other evenings too) we strolled over the Ponte Vecchio in the darkness. Quirky by day it is more beautiful by night when the vast numbers of tourists have dispersed and the shops are closed up. You can see the shutters and building details much more clearly. Add to that a mellow atmosphere, great views of the city by night and a musician playing in the middle of the bridge and it makes for a great place to hang out. 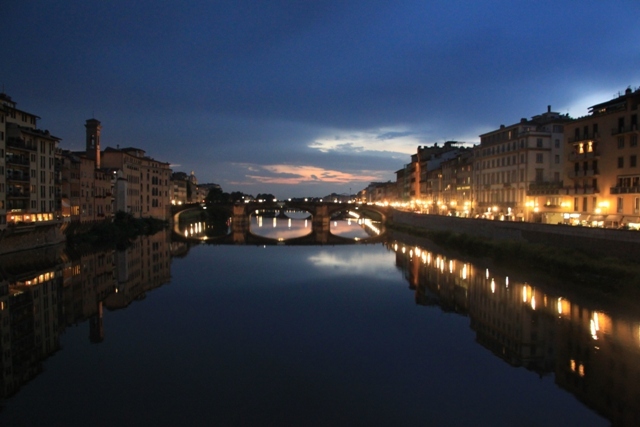 A great place to spend your last perfect evening in Florence too…. The motorbike was a big hit – now sitting proudly on his souvenir shelf! I love a good market abroad – there were so many great little bits and pieces. I know exactly what you mean about Christmas too Rosemary – I am procrastinating, reading travel blogs and such like when I should be getting organised!! Enjoy your weekend too. It really does look lovely there. Florence has long been on my travel list but goodness knows when I might make it there. 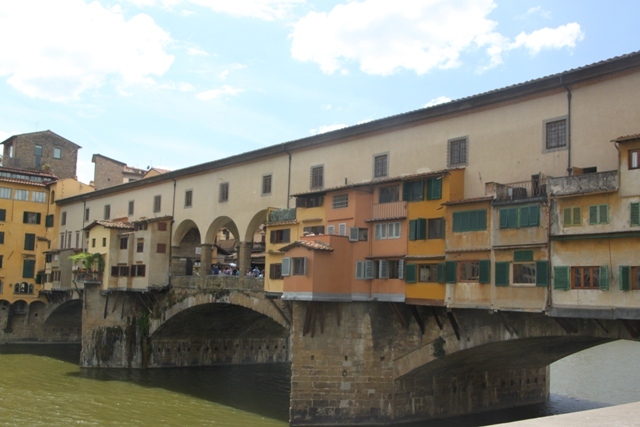 I wonder if the Pulteney Bridge was inspired by the Ponte Vecchio. 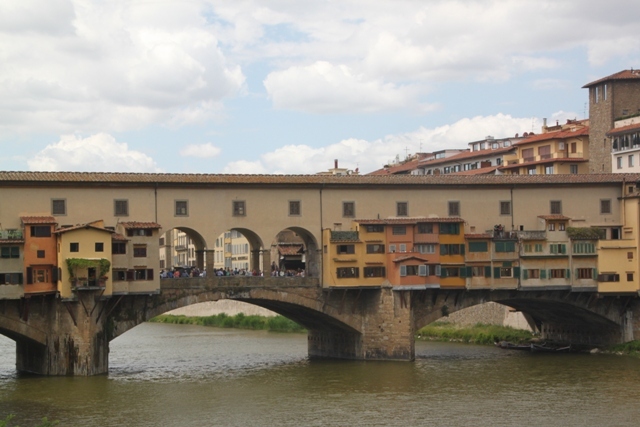 Never thought about it before but there is definitely a similarity between the Pulteney Bridge and the Ponte Vecchio – although my pictures of the former are shrouded in gloom and grey skies! 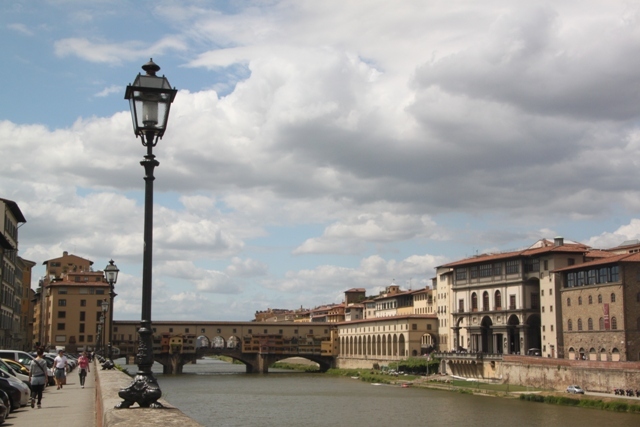 Florence is an amazing city – keep it on your list just in case!! Your beautiful photographs bring back wonderful memories of our time in Florence. Thank you! It is a gorgeous city – I hope we can go back someday. Wineries and pool time sounds good to me though!! Three boys in the family would probably love the motorcycles! Definitely! They were very reasonably priced and made a great souvenir for our son. Great pics!!! 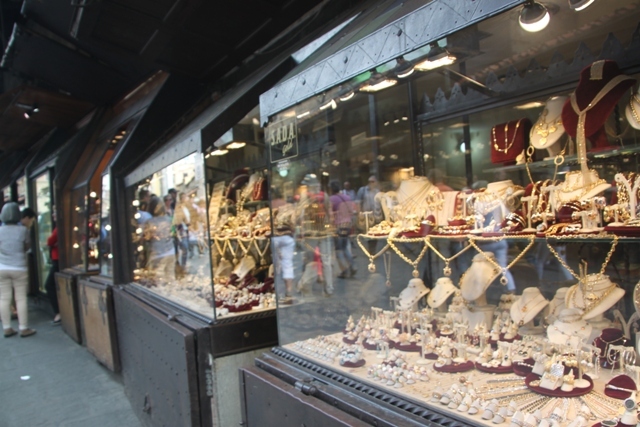 Love the little shops along the bridge…soooo much jewelry! Thanks Diana – we did more than our fair share of browsing in the windows and stalls along the bridge. That was the best night time picture we had from the bridge – can you believe it, taken by my son on a mobile phone!! Despite the fancy camera settings this was the best one we got! It’s unlikely that I will visit the Arno so thank you for allowing me to accompany you and your family. Safe travels! Thank you for coming along with us!! nice photos! Did you stay at an airbnb? 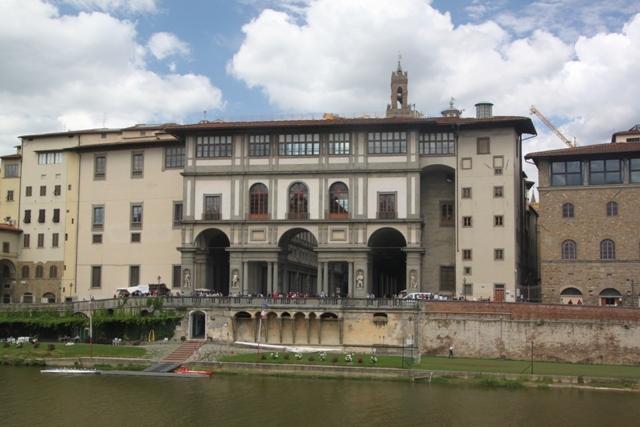 I stayed at one when i visited florence and it was right near the bridge too. We actually found the apartment through HomeAway not airbnb – but being near the bridge was fab!! Thank you for dropping by here too!! It’s lovely at night-time to walk across the bridge when the shops are all closed. The old wooden shutters are down and it is so much more beautiful. Also less people…. The faraway views are the best though..